Montbonnot, France – 20 May 2015 – The Raisonance development tool team today announced the winners of the STM32 Chrom-ART™ Application Design Contest – an open competition created in cooperation with STMicroelectronics for application designers using the STM32F429 microcontroller with Chrom-ART Graphics Accelerator™. This year's $5000 Grand Prize went to SmartOpen4, a smart phone companion application that, like a smart watch, provides notifications and status updates about the smart phone that it connects to via Bluetooth. Second prize ($3000) and Third prize ($1000) went to ZP Video Player and the game RoboWarz respectively. 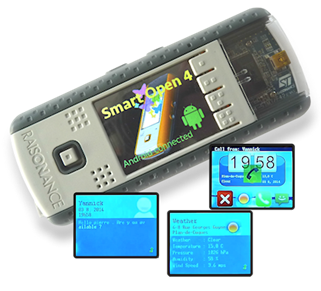 The EvoPrimer or Open4 hardware running SmartOpen4 connects to Android smart phones via a Bluetooth connection. It recuperates and displays status information and messages from the phone's applications such as incoming communication alerts or data from the phone's weather forecast application. SmartOpen4 is a great example of how an application can act as an extension to a smart phone, in much the same manner as smart watches that are reaching the market today. The application's use of the Chrom-ART™ Graphics Accelerator allows it to manage graphic display in a user interface that closely resembles the smart phone's user interface and with minimal impact on the processor. ZP Video Play, the Second prize winner, provides a media player for playing AVI files including an audio track on the EvoPrimer or Open4 platform. The application implements the Chrom-ART Accelerator™ to manage a touch screen user interface while leaving the processor free to manage the video and audio content. The contest applications use the STM32F429 with ARM Cortex-M4 core and 2-Dimensional Direct Memory Access (DMA2D) peripheral for managing and displaying graphics on TFT LCD screens. Known as the Chrom-ART Accelerator™, the peripheral is supported by on-chip drivers for external memory, displays and cameras and provides unprecedented graphics-handling capabilities to enhance user interfaces in microcontroller applications. Applications are implemented on the STM32F429 EvoPrimer development platform with color TFT touchscreen and a complete compiling and debugging tool set. Using the provided code samples and DMA2D libraries, users can rapidly enhance their applications’ graphical interfaces with handling of multiple graphic objects, transparency, layering, movement and animation with very simple code and without detracting from processor performance.